A wise choice for your new dining space, this Bella Counter Stool with curved metal legs and a dark finish adds elegant styling. It has a backless design that makes it fit into smaller or counter areas. Bourbon bonded-leather upholstery on the seat with swivel feature promises comfort and mobility. This traditional-style stool adds a bit of beauty and charm to any room. 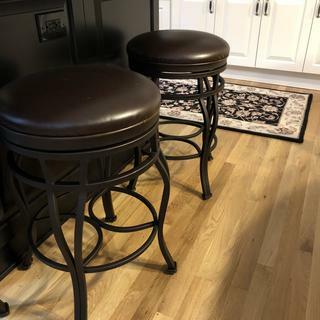 Great, sturdy, swivel stools! Exactly what we were looking for to complete the seating at our kitchen island.